Time flies at the moment with a lot of it directed to The Toy Mk2. The logistics of finding storage for it then arranging insurance which is based on the secure storage location meant things were cut quite fine on the run up to collection of The Toy Mk2. Couldn’t fault Kingsmill Leisure on the handover who showed us where everything was and how it operated. Only thing I can’t seem to find is a jack for the fitting of the spare wheel. Printed out the Fiat Ducato manual as it doesn’t come with the van and at 260 odd pages I can see why. Talking of the handover, there is a lot to take in and a lot of it goes straight out of the window come your first trial run. The van did come with a RollerTeam document bag full of all the manuals for the kit. 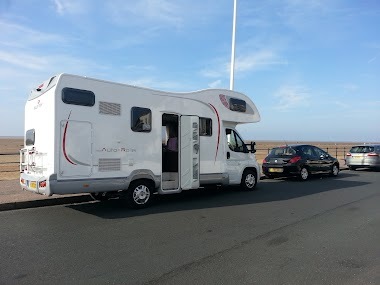 Things NOT to do with a new motorhome with an automatic gearbox are jumping on the brake thinking it is the clutch, this was before I’d even left the carpark. The trip home proved to be eventful with a Fiat 500 merging with motorway traffic at 50mph. This leaving me with nowhere to go but the middle lane. It’s built on a van chassis and handles like a heavily laden one. I’d be lost without the rear view camera and it did prove to be a deal breaker on some of the other motorhomes I’ve been looking at. I’ve had 2 shake down trips now to sort things out. One of the first problems was the wheel base and roundabouts, don’t cut it to short or the rear wheels will ride up on the curb. Riding has taken a back seat at the moment but I did make it to the Tour of Britain Knowsley safari Park finish. The point of the photo is the kid on the purple fleece guys shoulders with the Wiggo sideburns on. Good day but Cav got beat. Made it into the Eureka cafe video. Link to come. Need to loose weight by the looks of things. It’s been an eventful week or so, in terms of what I’m planning for the future it’s small change. Frank, we wish you all the best with your new toy, but we still haven’t met. Now the rain has stopped, perhaps you could visit us….lots to talk about. Barbara & Alan, retired couple from Bebington. Really welcome your thoughts on the build up needed for an Etape like you did in 2009. The 2013 stage looks almost doable – I go down the gym twice/three times a week. How long and what did you do for your etape?